We have been growing willow for basketry since 1994 at Dunbar Gardens. As Katherine became interested in willow basketmaking, she realized she would need to grow her own materials since very little cultivated willow was available to purchase in our area. In addition, it gave her more choice in selecting the size, color, flexibility and other characteristics of the willow she weaves with. As a result, we have tried quite a number of species and varieties of Salix here and currently have 60 varieties growing. 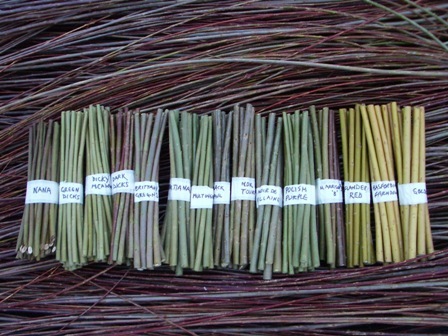 We have planted over ten thousand willow cuttings on our Skagit Valley farm. Willow is easy to propagate in most soils. An eight to twelve inch cutting taken from a dormant one year old rod is planted directly into the ground in Spring. March thru April is an ideal time to plant. We have willows that are useful for basketry, garden trellises, living fences, furniture, and ornamental hedges. Willow is a very useful family of plants! We have a list and descriptions of some of the varieties that we have had success with on our website. We are now cutting our willows and will begin shipping orders for cuttings next month. This entry was posted in willow and tagged basketry, cuttings, Dunbar Gardens, gardening, salix, Skagit Valley, Washington, willow by Steve@DunbarGardens. Bookmark the permalink.